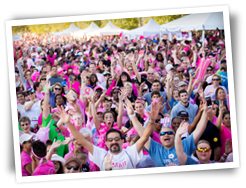 Another year has passed and we are gearing up for the American Cancer Society's Making Strides Against Breast Cancer Walk on Sunday, October 16 at Jones Beach State Park. Last year our fabulous TEAM raised $127,256 for the fight against Breast Cancer! Through your combined efforts, Aesthetic Plastic Surgery, P.C. placed as the number SIX fundraiser in the NATION! On Long Island we came in FIRST PLACE; WE are number ONE! Congratulations to ALL for ALL of your successes from 2015!!!!! This year, Aesthetic Plastic Surgery, P.C. is proud to say that our corporate team has been added as a member of the NATIONAL PARTNERS PROGRAM. This elite group enhances the efforts of the American Cancer Society to help finish the fight against breast cancer. Thank you to ALL of our WALKERS, TEAMS and SUPPORTERS for helping to make this happen! In joining this elite group, we have ALL furthered our partnership with the American Cancer Society by increasing our Making Strides Against Breast Cancer teams and participation nationwide. We are, once again, proud Flagship Sponsors of the Walk and we ask you to join us for this beautiful and worthwhile cause on SUNDAY, October 16, 2016 at 7:30a.m. at Jones Beach State Park. As you enter FIELD 5, look for our banner with the doctors’ names on our tent: Dr. Randall Feingold, Dr. Ron Israeli, Dr. Peter Korn, Dr. David Light and Dr. Jonathan Bank. We will be there to meet you with sweatshirts, coffee and breakfast. This year our sweatshirts will be NEON PINK! I have enclosed a contribution form for you to collect donations for the American Cancer Society. If you do not intend to walk, please mail or drop off your forms, with contributions, to our office prior to October 16. If you are walking, please bring these with you to the beach. I will be collecting contributions and walk papers at our tent. There are three ways to fundraise online. You can fundraise with us; you can form your own team under the umbrella of our company name: Aesthetic Plastic Surgery, P.C. ; or you can make a straight online donation to our team: Drs. Feingold, Israeli, Korn, Light and Bank. Click here to see the Online Fundraising Instructions.